And a delicious one at that! Here is an adorable food craft that’s perfect for Christmas, Valentine’s Day, or a cute topping for a cake or an ice cream sundae. Drain the cherries and pat them dry with paper towels (I also rinse mine. It helps the chocolate stick to the cherry). Line a cookie sheet with waxed paper. 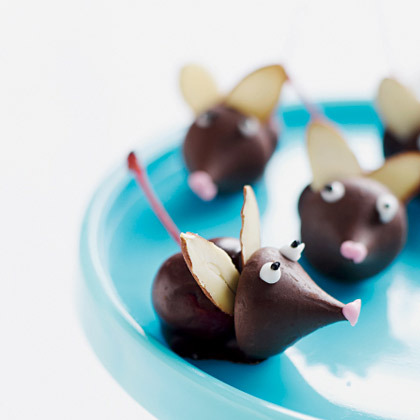 Use canned frosting, decorating gel, or a piece of candy to add eyes and a nose to your mouse. You can create a fast gel by adding a teaspoon of water to a couple tablespoons of powdered sugar. If the paste is too runny, add more sugar. Too dry, more water. Once you have the right consistency (it should be sturdy like frosting), divide it into three bowls. Color one black and one pink. Place into three separate Ziploc bags and snip a corner of the bag to create a decorating bag. Use white and black for the eyes and pink for the nose. thanks! They’re so easy to make!